GRI released its draft of the G4 for comment. There are some significant changes that are proposed, some of which will make companies scream, but some of which will help companies to do a much better job of reporting their most material CSR issues. That should lead to increased quality of reporting for both amateur and professional users alike, and should aid in making CSR reporting more integrated and, hopefully, interesting! The changes fall into four main categories: Governance, Supply Chain, Materiality Process and Certification. Several changes to how companies are required to report management and control appear in the G4. None are less controversial than the requirement to report on the ratio of highest paid worker to lowest paid worker and median earner on a country-by-country basis. Also controversial may be the claw-back reporting requirements, which go well beyond legislative requirements in many countries. It’s difficult to imagine executives taking those changes lightly, but they will be a welcome addition for the rest of us in relation to the ongoing discussion of executive remuneration and provide fuel for effective discussion of economically viable levels of payment of executives and high earners within companies. Many of the other governance reporting requirements are similar to information already required for listed companies in many parts of the world, including executive compensation and break-down of discretionary compensation, and shouldn’t be a source of controversy. Reporting obligations in relation to suppliers, on first blush, have massively increased. Firstly, the suggestion from the previous version that only major suppliers need be asked questions about their CSR performance is gone. Instead companies must report on a wider range of issues (adequate remuneration of workers in supply chains, human rights, supplier turnover rates, time taken to pay suppliers, labour dispute frequency and resolution, social performance and environmental performance; among others) for all of their suppliers and potentially report much further into their supply chain. Secondly, a lot more supply chain reporting forms part of the standard set of indicators. The trade off for potentially including every supplier and a more comprehensive data set is that companies can decide how to report on their suppliers (by region, total spend, type of supply and a few others) and set their own ‘boundary’ for reporting purposes. I think the proposed changes reflect the way that supply chain reporting has shifted since the G3 was launched, although they won’t be without some controversy. One of the weaknesses of the GRI G3 has been its inability to adequately identify which of the plethora of indicators and processes are most important for any specific company to get right in order to create value and minimise negative impacts on people, planet and profit. Of course some companies will want to keep their reporting standards high in order to meet transparency expectations. 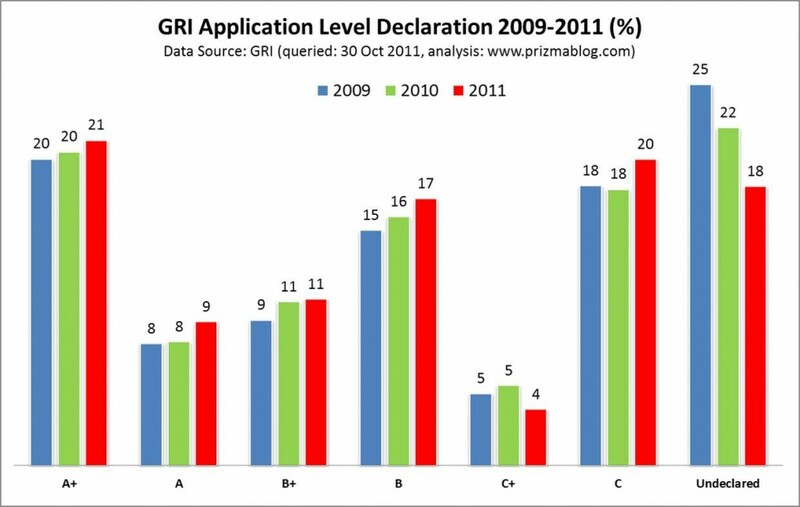 Perhaps the most significant change is the removal of the certification (self assessed or assured) of GRI Levels A, B and C. Instead they are opting for ‘prepared in accordance with GRI’. The new system effectively requires compliance with management process and reporting on the most material indicators, along with reporting of all indicators in any applicable sector supplement. Companies can also adopt a ‘comply or explain’ approach in relation to indicators for which it cannot report for legal reasons or if they do not have relevant data. There are several aspects of this that require more time than I want to spend here, but broadly it means that reports ought contain the most relevant metrics to any particular business. At one level this is deeply satisfying, because some of the best reports I read are level C (such as the How We Do Business Report 2010 by Marks & Spencer – one of my all-time favourites) while some of the least useful are level A. There seems to be something about identifying and reporting on a company’s most material issues that leads to a significantly more interesting report. Identifying the most material issues will also be of comfort to the SRI analysts among us. At another level it is also unsatisfying, because it means that there will be less direct comparability across reports. It also doesn’t necessarily follow that a company will always accurately identify the most material issues, and there isn’t an obvious mechanism to challenge that identification. I think that on balance the changes are a step in the right direction. Like the team at Radley Yeldar (with their How does it stack up report) and Elain Cohen with her Cone Awards, I think that the best reports are primarily instruments of communication and trust. The changes should help companies to understand and report on the most relevant metrics and, once a company understands their most relevant issues, they should be able to tell a more compelling story, including how addressing each issue simultaneously adds value to the company and also to society. I also agree with Adrian Henriques that the changes should simultaneously lead to “a more serious exploration of what a company’s place in a sustainable world might be”. Both perspectives mean that we should see an increase in integrated reporting and fast tracking of the journey to sustainability dialogue which is transparent, informative and good for business. The sting in the tail might be that companies claim GRI status while keeping very narrow boundaries, just like others have done with G3. I suspect that the latter can be mitigated by vigilant scrutiny from SRI analysts, communication specialists and CSR professionals. On balance, big ticks from me! Hi dwayne, great post and interesting thoughts. I am also, as you might have imagined, working on my response to the propsed G4 – I’ll keep quiet for now as I get my thoughts together. But I will be posting soon :). Thanks for the Conde Awards mention!